Eysenck HJ (1952) The effects of psychotherapy: An evaluation. Journal of Consulting Psychology, 16, 319-324. Kaplan BJ, Poltajko HJ, Wilson BN & Faris PD (1993) Reexamination of sensory integration treatment: A combination of two efficacy studies. Journal of Learning Disabilities 26, 342-347. Mangeot S. D., Miller L. J., McIntosh D. N., McGrath-Clarke J., Simon J., Hagerman R. J., & Goldson E. (2001). Sensory modulation dysfunction in children with attention-deficit–hyperactivity disorder. Developmental Medicine & Child Neurology, 43(6), 399-406. McIntosh D. N., Miller L. J., Shyu V., & Hagerman R. J. (1999). Sensory–modulation disruption, electrodermal responses, and functional behaviors. Developmental Medicine & Child Neurology, 41(9), 608-615. Miller L.J., McIntosh D.N., McGrath J., Shyu V., Lampe M., Taylor A.K., Tassone F., Neitzel K., Stackhouse T., & HagermanR.J.. (1999). Electrodermal responses to sensory stimuli individuals with fragile X syndrome : A preliminary report. American Journal of Medical Genetics 83, 268–279. Ottenbacher, K. (1982). Sensory integration therapy: Affect or effect. American Journal of Occupational Therapy, 36(9), 571-578. Polatajko, H. J., Kaplan, B. J., & Wilson, B. N. (1992). Sensory integration treatment for children with learning disabilities: Its status 20 years later. Occupational Therapy Journal of Research, 12(6), 323-341. Vargas, S., & Camilli, G. (1999). 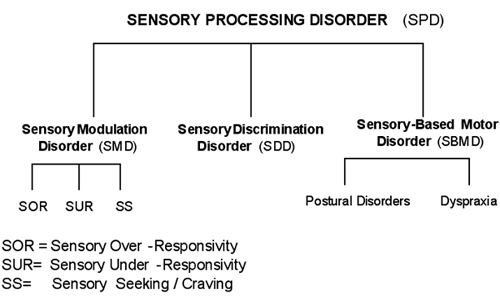 A meto-analysis of research on sensory integration treatment. American Journal of Occupational Therapy, 53(2), 189-198.